If you're an experienced builder and flyer of rc planes, there's surely nothing more satisfying than building a large scale model from a plan! 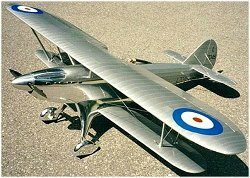 Canadian aeromodeller Bob Bishop has designed four fantastic models and I'm happy to say that his plans for these beautiful rc airplanes can now be ordered through this website. This beautiful biplane is probably one of the least known of the Fairey bipes, yet surely one of the most attractive! Bob's version is approximately 1/5 scale with a wingspan of nearly 86 inches ( 2180mm), and intended for a 1.8 2-stroke or equivalent 4-stroke. Another Fairey classic, the famous Swordfish is an imposing bipe used mainly for torpedo bombing in WWII. Bob's 1/10 scale design is for electric power, with IC conversion possible. 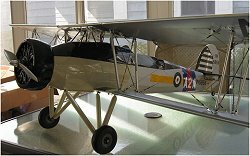 This lovely looking biplane is probably the best know of all the Curtiss Hawk variants, and served mainly in the 1930s. 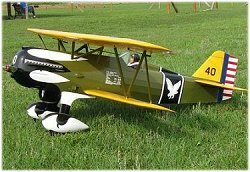 An unusual yet appealing rc subject, Bob's version is a large 1/4 scale with a wingspan of 94.5 inches (2400mm) and for a 50cc gas engine. Following the Great Depression of the 1930s, the Airmaster was the plane that helped Cessna recover from the economic woes that hit the aviation industry in that time. An iconic airplane who's shape typifies that golden era of flying! Bob's version is 1/4 scale with a large 102.5 inch (2603.5mm) wingspan and intended for a 1.6 glow / 26cc gas engine. 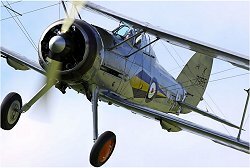 This iconic British biplane was a single seat fighter developed in the 1930s and served in the early part of WWII. Surely one of the most recognizeable bipes of the time, and a very appealing large scale subject! Bob's version is 1/5 scale with a wingspan of 77.4 inches (1966mm) and intended for a 1.8 2/4-stroke, or Zenoah G-38. All of Bob's large scale rc aircraft plans can be purchased via the relevant page, and purchases are made securely through Paypal. If you have any questions or concerns about ordering these large scale rc airplane plans through this website, please contact me and I'll be happy to answer them!